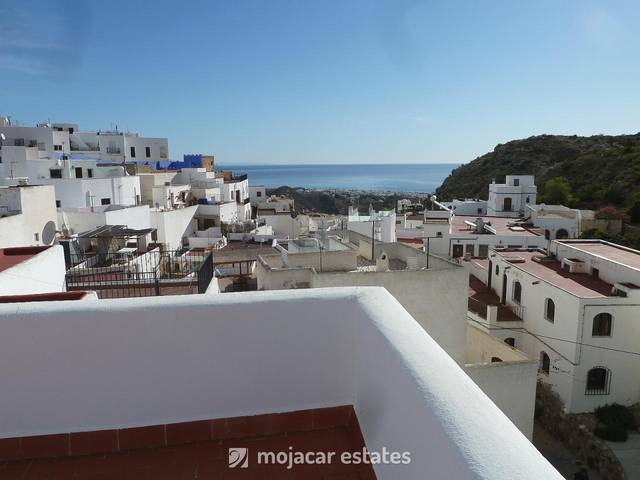 Cosy apartment of (80 m2) in the classified village of Mojacar. The cosy apartment has all amenities such as water, electricity, internet. In the apartment there is a living room, kitchen, 3 bedrooms, 1 bathroom, office space, storage room, terrace. The apartment is located in Mojacar, Mojacar is located in the Spanish province of Almería on the Costa de Almeria. Mojacar’s Moorish Old Town is set on a hill and overlooks a stretch of 17 km of pristine beaches. From there Mojacar looks like a beautiful, typically Andalusian white village hanging on the side of the hill. It is an enchanting city with whitewashed old buildings, a maze of winding streets and alleys and romantic courtyards. The old town offers beautiful views of the mountains, the sea and the desert “Taberna”. Every summer, the local people honor their Arab ancestors with a spectacular festival of “Mros y Cristianos”. It is a very credible spectacle, with extravagant costumes, Arab sabels and counterfeit street fights of then. Mojacar Playa is located on the coastline below the village of Mojacar and has a totally different atmosphere; It is a modern and lively seaside resort, tastefully developed without forgetting the traditions and there is a 9 km long beach with all the necessary facilities for holidaymakers – restaurants, traditional bars, shops, villas and apartments with sea views.